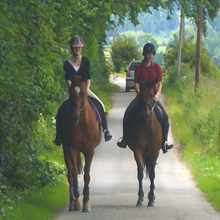 Seaforth Riding Centre is a professionally run livery/training yard situated on the beautiful Brahan Estate, in Ross-shire near the village of Maryburgh and just two miles from the market town of Dingwall. The yard is run by Elaine and Ian Taylor. Elaine has worked in the horse industry all of her working life in various types of yard, including show jumping, hunting and dressage.